Planning on getting any condominium carpentry projects started this season? 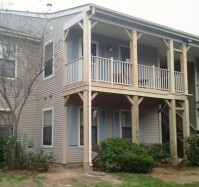 Perhaps a balcony replacement project like the one we completed here? Rezkom has a team of highly skilled craftsmen who are professionally trained and equipped to handle all of your buildings’ carpentry needs. Contact us today for more information about the different carpentry services we provide! Our prices are competitive and all our work is fully guaranteed!